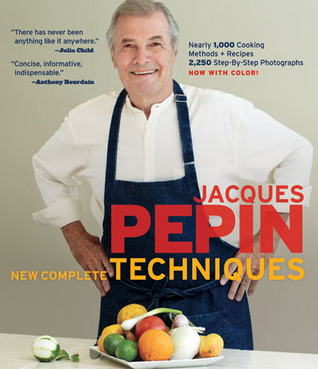 Cook Book Alert: Jacques Pépin New Complete Techniques by Jacques Pépin. Jacques Pépin New Complete Techniques by Jacques Pépin. Fans of Pépin’s classic books La Méthode and La Technique rejoice: the master French chef has reshot all the photographs from those books for this new single volume. Everything from boning a chicken to making fancy decorative fruit garnishes to, turning an old refrigerator into a smoker, Pépin shows you how to properly function in the kitchen with thousands of step-by-step photographs. Black Dog & Leventhal Publishers: November 13. Pretty excited about this one. I really appreciate the classic French culinary technique. So clean, precise, and beautiful. He definitely knows his stuff and is one to trust! The time-tested recipes show everyone, from the greenest home cook to the seasoned professional, how to put techniques into practice. This completely revised edition will include thousands of color and black-and-white photographs throughout and is redesigned to make it even easier to follow the step-by-step techniques. Previous Post Game Day Chili! Next Post It’s Official! Wild Thyme Hit’s The National Stage In Cooking With Paula Deen Magazine!